WASHINGTON, D.C. – Today, members of the Congressional Western Caucus and the Senate Western Caucus released statements of support for David Bernhardt's nomination for Secretary of the Department of the Interior after his nomination was officially transmitted from the White House to the United States Congress. Senate Western Caucus Chairman Steve Daines (MT): "David is incredibly qualified to serve as Secretary at the Department of the Interior. I look forward to continue working with him to advance priorities for Montana and those of other western states – such as improved management of our federal lands, increasing public access to public lands, and fixing the national park maintenance backlog." Chairwoman of the Senate Energy and Natural Resources Committee Lisa Murkowski (AK): "I strongly support David Bernhardt to serve as Secretary of the Interior. He is an excellent choice and has demonstrated he is more than capable of leading on a permanent basis. It is critical that our Interior Secretary understand Alaska and I have no doubt he will continue to be a strong partner for our state. I will schedule a hearing and seek to move his nomination forward as expeditiously as possible." Senator Kevin Cramer (ND): "It’s good to see President Trump nominate someone as experienced as David Bernhardt. As chairman of the EPW Subcommittee on Fisheries, Water, and Wildlife, we oversee the Department of Interior’s U.S. Fish and Wildlife Service. I look forward to meeting with Mr. Bernhardt to discuss the ways we can work together." Senator Mike Lee (UT): "David Bernhardt has done great work so far as Deputy Administrator. We hope he continues the work the administration has been doing to increase access, productivity, and active management to our nations federal lands and maximize collaboration with the states." Senator Dan Sullivan (AK): "David Bernhardt is an excellent choice to be our next Secretary of the Interior. He is a strong advocate for the goal of energy dominance, and will help facilitate Alaska’s role in that goal. During his years of private practice and leadership positions at the Interior Department during both the Trump and Bush administrations, he has gained a deep understanding of Alaska’s unique land issues – including ANILCA. He has also shown a commitment to the Interior Department’s trust responsibility to Alaska Natives. I believe that Mr. Bernhardt will be a great Secretary of the Interior for my state, and for our country." Senator Jim Inhofe (OK): "I fully support President Trump’s nomination of Acting Secretary David Bernhardt to serve permanently as Secretary of the Department of the Interior. He has proven his leadership at the agency and I have no doubt he will only build on his years of experience from here. I look forward to working with him in this new role." Senator John Hoeven (ND): "Acting Secretary David Bernhardt, who was previously confirmed with bipartisan support to serve as deputy secretary, has the right experience and background to lead the Interior Department. His record shows a balanced approach to managing our nation’s public lands in a way that supports multiple uses, including grazing, energy development and recreation. As a member of the Senate Energy & Natural Resources Committee, I look forward to considering his nomination in a timely manner." Senator Cory Gardner (CO): "This is fantastic news for Colorado. I’ve known David Bernhardt for many years and have worked closely with him over the last two years to advance Colorado priorities. As a native Coloradan from the Western Slope, David knows how important public lands are to our state and has a keen understanding of the issues Coloradans face every day. From moving the Bureau of Land Management to the West to promoting conservation programs like the Land and Water Conservation Fund, Coloradans will be lucky to have David lead our Interior Department. I look forward to supporting him throughout the confirmation process." Congressional Western Caucus Chairman Paul Gosar (AZ-04): "Nobody knows the issues facing the Department of the Interior better than David Bernhardt. David loves his country and has served her well as a dedicated public servant for more than a decade. Acting Secretary Bernhardt knows responsible energy production and protecting our environment are not mutually exclusive goals. During his tenure, David has worked diligently to increase hunting and fishing access, ensure clean water for future generations and empower local decision-making. David is a champion for sportsmen and rural communities. David has an incredible work ethic and is a man of integrity. No one is more qualified or more responsive to the needs of the American people. I urge the Senate to confirm him as soon as possible." House Natural Resources Committee Ranking Republican Rob Bishop (UT-01): "President Trump’s nomination of David Bernhardt was a brilliant move. Absolutely no one is more experienced and ready for the job than David. He fully understands every issue under the purview of the Department of the Interior and respects the importance of local decision-making. I urge the Senate to act quickly on his confirmation." Congressional Western Caucus Executive Vice-Chairman Scott Tipton (CO-03): "As a native of the 3rd Congressional District of Colorado, David knows Western land issues inside and out. Coloradans will be glad to have him working to advance our interests as Interior Secretary. I hope the nomination process goes swiftly so we can continue working together to protect the way of life we enjoy in the West." 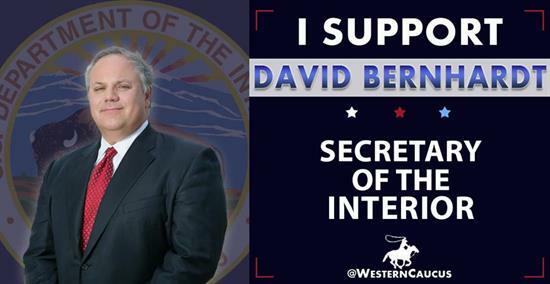 Congressional Western Caucus Chief Rules Officer Dan Newhouse (WA-04): "I congratulate David Bernhardt on his official nomination to serve as President Trump’s Secretary of the Department of the Interior. As DOI Acting Secretary, Bernhardt has shown that he understands natural resource issues that are so important for the West and for Central Washington. I especially look forward to working with Secretary Bernhardt on the proposed rule to delist the gray wolf and to make progress on the Odessa Groundwater Replacement Program and the Columbia Basin Project." Congressional Western Caucus Chief Infrastructure and Forestry Officer Bruce Westerman (AR-04): "Mr. Bernhardt has done a fantastic job and proven himself in his previous role as Deputy Secretary, and I’m looking forward to his continued strong leadership at DOI as he transitions into his official capacity as Secretary." Congressional Western Caucus Chief Regulatory Reform Officer Andy Biggs (AZ-05): "President Trump has been a great friend to people in the West. Over the last two years, the Department of the Interior repealed overreaching Obama-era regulations, streamlined the path for sustainable energy and natural resource development, and expanded access to public lands. I believe that Acting Secretary Bernhardt will build on the good work that DOI has done for western states, and I look forward to his swift confirmation." Congressional Western Caucus Chief Agriculture and Business Officer Doug LaMalfa (CA-01): "Acting Secretary Bernhardt has done a tremendous job in his short time at the helm of the Department of the Interior. I’ve worked closely and successfully with DOI under this Administration to improve the stewardship of our lands, both in Northern California and across the country, and I expect that to continue under his leadership. I applaud the nomination of David Bernhardt for Interior Secretary, and I hope the Senate completes the confirmation process as quickly as possible." Rep. Ken Calvert (CA-42): "I want to congratulate David Bernhardt on being nominated as our next Interior Secretary. In his time at Interior, David has already made a positive impact by focusing the Department on the important issues impacting California, especially when it comes to managing our states water challenges. As Secretary, I know David will utilize his robust experience to help the Department carry out its important mission." Rep. Pete Stauber (MN-08): "I am excited about this important step in the nomination process. Future Secretary Bernhardt will continue to be a great leader of the Interior Department and I look forward to working with him to bring commonsense solutions to our nation’s problems and help unleash the economic engine and boundless resources in Northeastern Minnesota." Rep. Aumua Amata Radewagen (American Samoa-At Large): "I appreciated David Bernhardt’s recent presence at the Interagency Group on Insular Areas. In the islands, where fishing is a way of life and the backbone of our economy, we also appreciate knowing he enjoys fishing. The Interior Department is an important relationship for the Territories, and David Bernhardt has the right experience and knowledge to continue leading the Department." Rep. Tom Emmer (MN-06): "I am proud to share my support for the confirmation of Acting Secretary David Bernhardt to permanently fill the role of Secretary of the Interior. The Secretary of the Interior is a vitally important job, and I have full confidence in Acting Secretary Bernhardt’s ability to serve our nation proudly. Through his years of service to the Department, he has displayed a deep understanding of the issues under his jurisdiction, and I know he will carry out necessary measures to ensure conservation, management, and development of federals lands is handled appropriately, with Americans best interest in mind. I look forward to seeing him confirmed soon." Rep. Paul Cook (CA-08): "I’m pleased President Trump has nominated David Bernhardt for Secretary of the Interior. David has extensive knowledge of the challenges impacting public lands in California and the West. He’s not afraid to tackle critical issues such as the need for improving our water infrastructure and active forest management to prevent wildfires. He’s ready to meet the challenges ahead and I hope the Senate will move quickly to approve his nomination." Rep. Kevin Hern (OK-01): "Congratulations to Acting Secretary Bernhardt on his official nomination to be the Secretary of the Interior! I look forward to working with Mr. Bernhardt on issues important to Oklahoma, especially our oil and gas industry, which employs hundreds of thousands of Oklahomans." Rep. Kelly Armstrong (ND-At Large): "David Bernhardt will serve as a steadfast steward of our nation’s natural resources and uphold our commitment to the Native American community as Interior Secretary. I have confidence that under his leadership, the Department of the Interior will continue to work with North Dakota and not against it. Mr. Bernhardt understands the historic and important role the Department of the Interior plays in conserving and managing our treasured lands, waterways and historic places so subsequent generations can enjoy them. He is an excellent choice for Interior Secretary." Today, March 11th, the White House sent Acting Secretary David Bernhardt’s nomination to be the next Secretary of the Department of the Interior (DOI) to the United States Senate. Acting Secretary Bernhardt has been a model public servant for more than ten years. He has served honorably at DOI as Solicitor, Deputy Secretary and now Acting Secretary. Mr. Bernhardt was also general counsel for a Western Caucus Congressman and the Third Congressional District now represented by Congressional Western Caucus Vice-Chairman Scott Tipton. Acting Secretary Bernhardt was confirmed as Deputy Secretary at DOI in July of 2017. Click here and here to view press releases from the Congressional Western Caucus and Senate Western Caucus in relation to that confirmation. If confirmed, Mr. Bernhardt would be the 53rd Secretary of the Department of the Interior. He was born in Rifle, Colorado. Mr. Bernhardt currently serves as Acting Secretary and Deputy Secretary of the Interior. He has served at the Department of the Interior for nearly a decade in various leadership roles. The Senate has previously confirmed Mr. Bernhardt twice to serve at the Interior – in 2017 as Deputy Secretary and in 2006 as Solicitor. He is an avid sportsman who served as a board member for the Virginia Board of Game and Inland Fisheries. Bernhardt earned a B.A. in political science with a minor in business administration from the University of Northern Colorado in Greeley in 1990. He graduated with honors from the George Washington University National Law Center in 1994 and is admitted to various state and federal court bars. He is married to Gena Bernhardt. They have two children and reside in Arlington, Virginia.